Vivian was thrilled with her pink shin guards, pink soccer ball and orange “cleats.” She pranced around showing them off to everyone, saying, “I’m ready for soccer!” She wants to do everything her big brother does. Big brother helped her put on her gear. He is so attentive and patient with her. 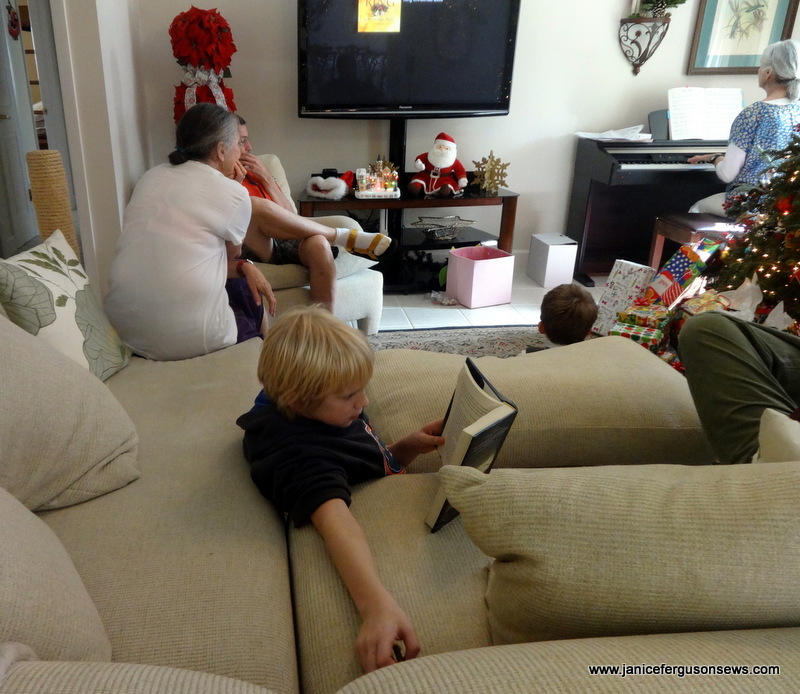 A voracious reader, 10 yo Robert was well into his new book about wolves as we listened to Christmas carols played on the piano. 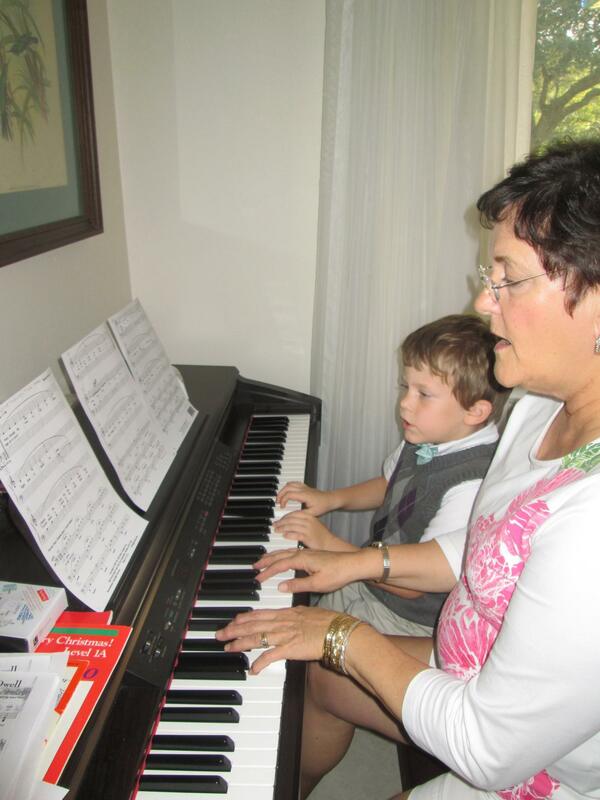 Alastair played a solo and then a duet with his grandmother who gives him a weekly piano lesson. 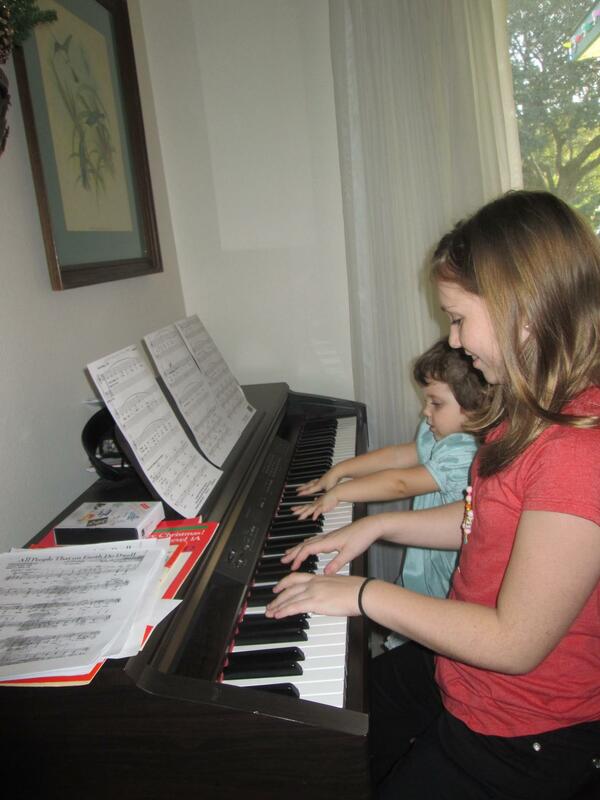 With three years of piano instruction, Laurel also played and was then accompanied by Vivian, self-taught. Roast goose and baked ham were on the dinner menu, along with too many sides to list. But Vivian couldn’t wait for it to be served. She was hungry. 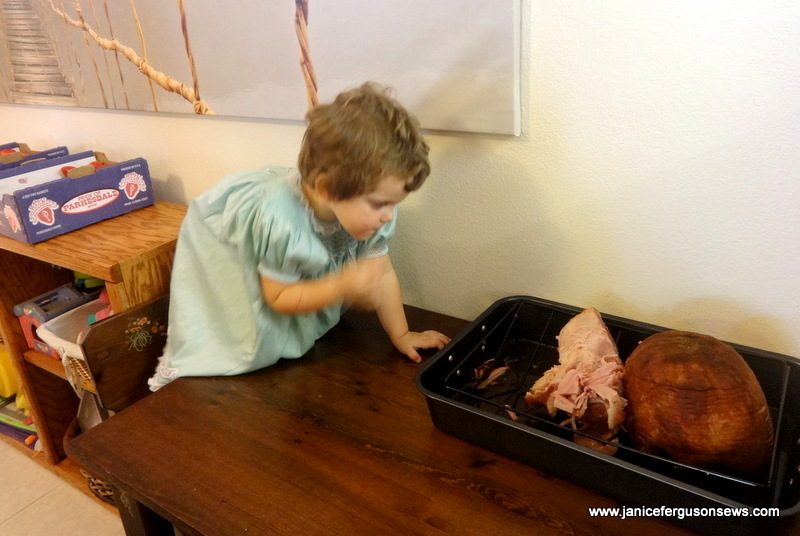 In her signature do-it-myself manner, she served herself to a few samples of ham. It was delicious. 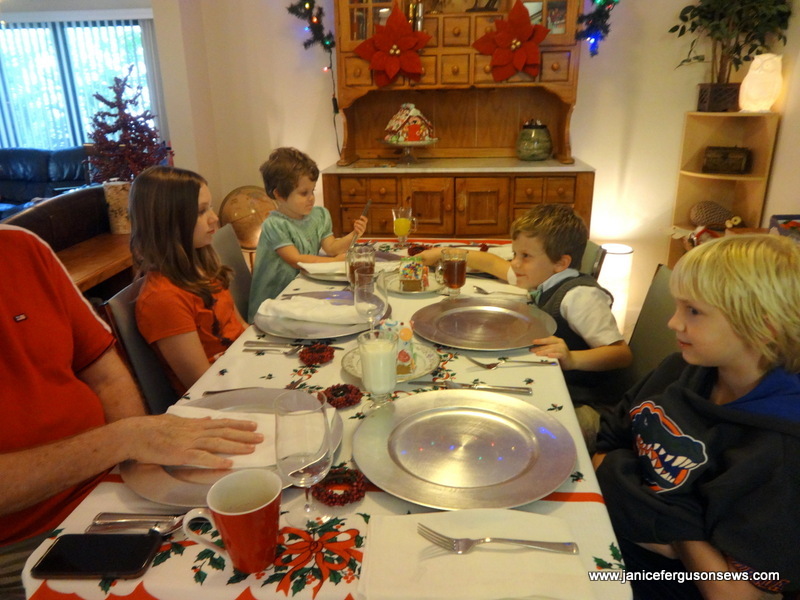 All four grandchildren at the kids’ table, waiting for their plates. They had already had fun with the crackers at each place setting and were ready to eat. The big guy on the left is my dear husband, their Granddad, who chose to sit with them instead of with the adults. Two tiny gingerbread houses made by Alastair and Vivian decorated the table. Because I got such a late start on Vivian Rose’s dress, it is not Christmas themed. 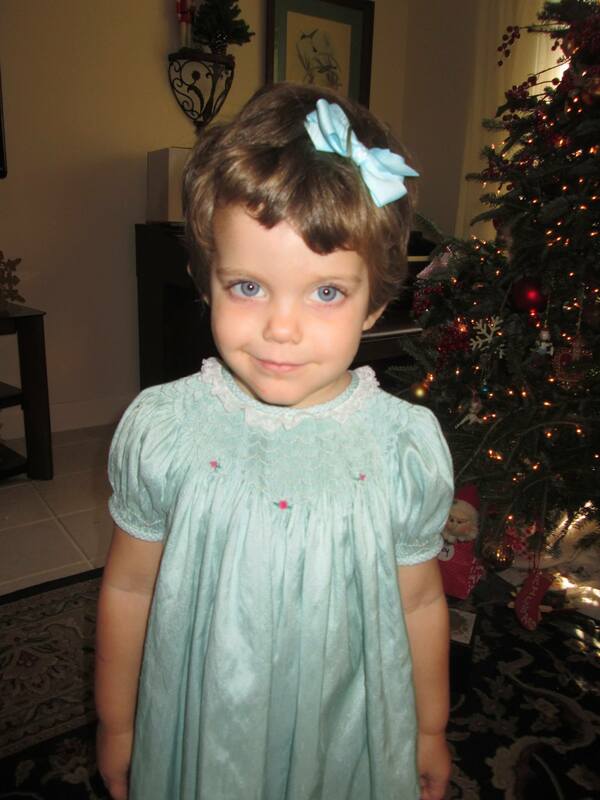 The aqua blue silk dupioni bishop, again Betsy pattern by Children’s Corner, can be worn year round. With all the activity, I didn’t get a good photo of the dress, but these show it in action. Vivi loved to twirl in it. Six year old Alastair had a matching silk bow tie with a tiny circular monogram on the knot. I really like the quick and easy free bow tie pattern/tutorial from Make it and Love It. 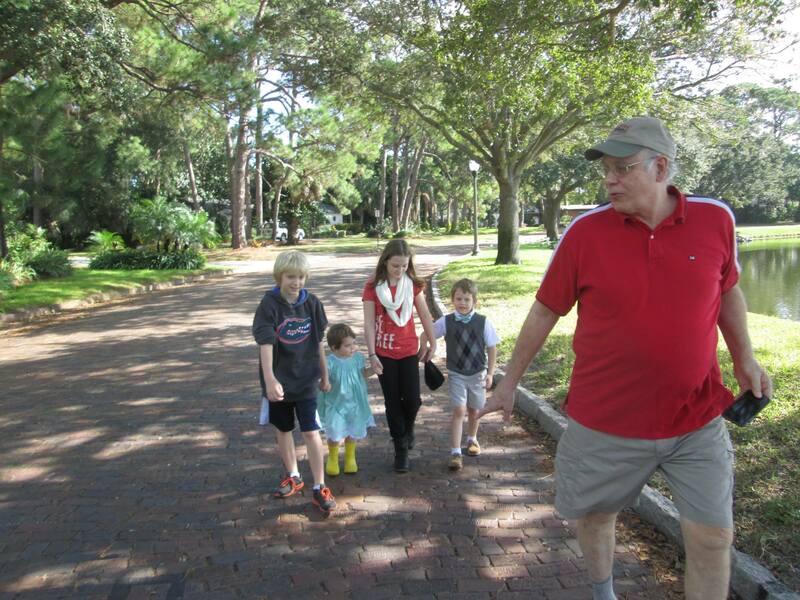 After dinner, Granddad walked the children down to the lake. What a beautiful Christmas day! dress features: lace–the lace is 100% nylon from Luc Smiers in The Netherlands. 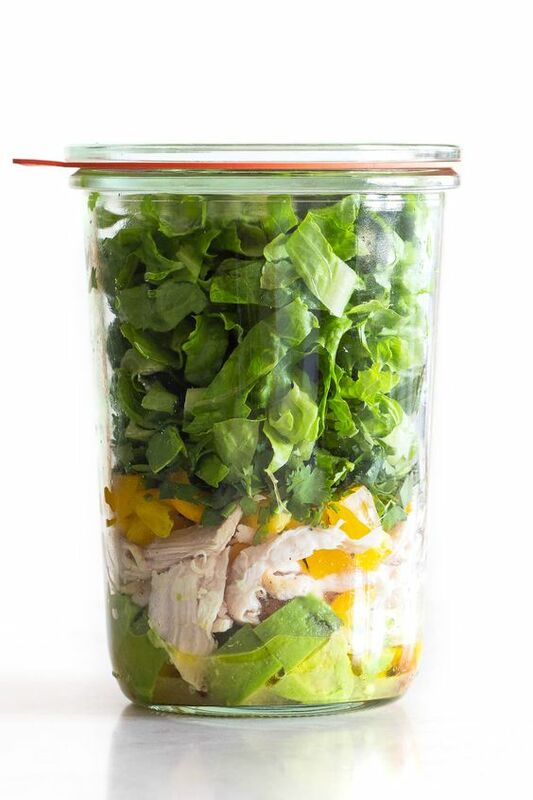 I am so grateful to Linda S. for tipping me off about this great product. It looks almost exactly like cotton lace and is just as soft. It has the added benefit of needing little or no ironing. My busy daughter rarely gets to ironing, so this is a great feature for Vivi’s clothes. There are a few disadvantages. The edging has a bit of a heavy thread scallop at the top which makes it impossible to find a pull thread for gathering. I ran a straight stitch at a 3.0 length and that worked just fine. But the scallop makes the header bulky. The insertion has a suitable pull thread for shaping but after about a yard, it broke. The skirt needed almost 4 yds. of insertion so again I had to insert a gathering thread. For shorter lengths, I think the built in thread would hold up. 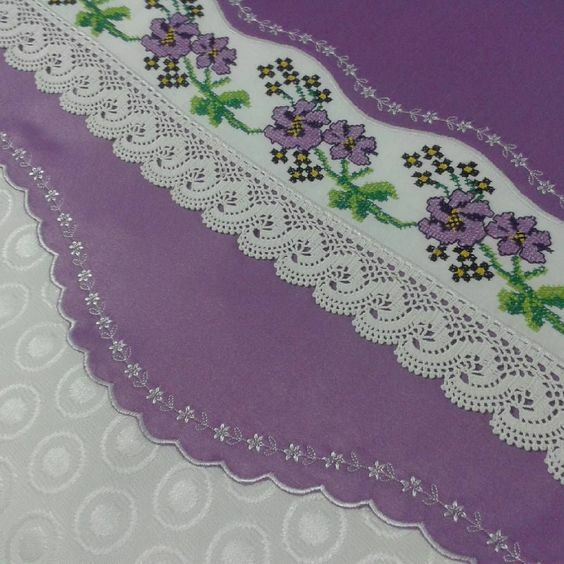 gimp work–I love pinstitch for securing lace to fabric, but silk dupioni is not a good candidate for that stitch. With the heavy header, it needed more than just a satin stitch. Zig zagging over gimp with 80 wt. thread gives a nice effect, and looks even nicer if you can see . This is really substandard. Vision problems have plagued me for the past several months. I’ll sew and see much better after next month’s surgery. fabric–silk dupioni is a joy to work with, once you beat the ravels into submission. I wanted to bind the sleeves and neckline with a different fabric and gingham always comes to mind. In my stash I had some silky synthetic aqua gingham seersucker whose color matched pretty closely so that’s what I used. 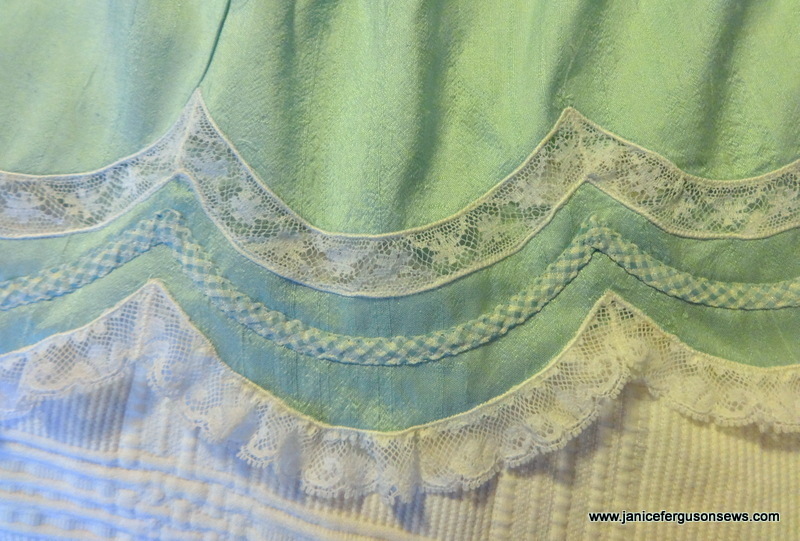 The smocking design is a variation on Ellen McCarn’s Buttercream. spaghetti bias— with a size 3 dress, there isn’t much room for a wide fancyband. The scalloped edging and insertion seemed to need more and I wasn’t up to featherstitching between the rows. So I made spaghetti bias with the same gingham. These tools made short work of the job. Fasturn has been around for a good long while, but the Tiger Eye is a new, marvelous companion. Because I wanted 1/4″ spaghetti bias, I used the smallest tube. I was not able to fit more than about 3.5 yards of that very sheer bias through the fasturn tube. And I had to work really hard compressing that much to fit on the tube. It pleases me to know that for all the Whimsy projects I have envisioned, I can easily make spaghetti bias of any fabric I choose. I’m sorry this post is so long. It’s hard for me to stop rambling about family celebrations and the sewing I do for them. Please share pictures of your Christmas projects. I would really love to see them. Send to me at NCcabin@aol.com. Happy New Year to All! 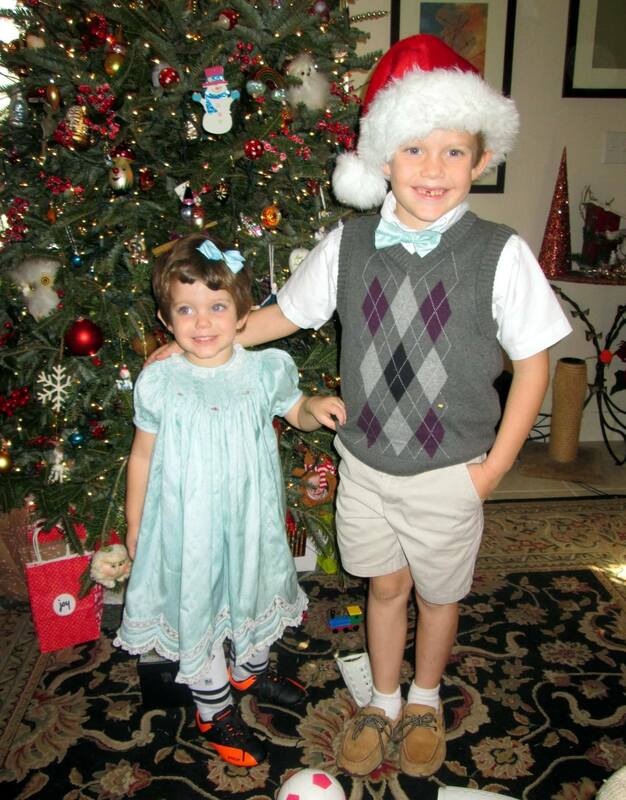 This entry was posted in Basic no-embroidery Machine Projects, boys, brother-sister, girls, heirloom sewing, smocking and tagged boy bow tie, Ellen McCarn Buttercream, fasturn, nylon heirloom lace, silk dupioni, smocked Christmas Dress, spaghetti bias, tiger eye. Bookmark the permalink. from list: Janice it’s beautiful as is all your work. Hope your next surgery goes well and you have a fast recovery. from list: Your work is always fabulous. The dress is gorgeous! from list: beautiful! love that hem too! from Mary Lynn: I just went to your blog and read some more construction details. Thanks so much for all the specifics. I’m not an experienced heirloom sewer, so I appreciate all the details I can get. Thank you for your sweet comments. But look at the gimp work at the hem. This is very poorly executed, but not too bad for someone who is half blind! Can you tell I need some vision correction? 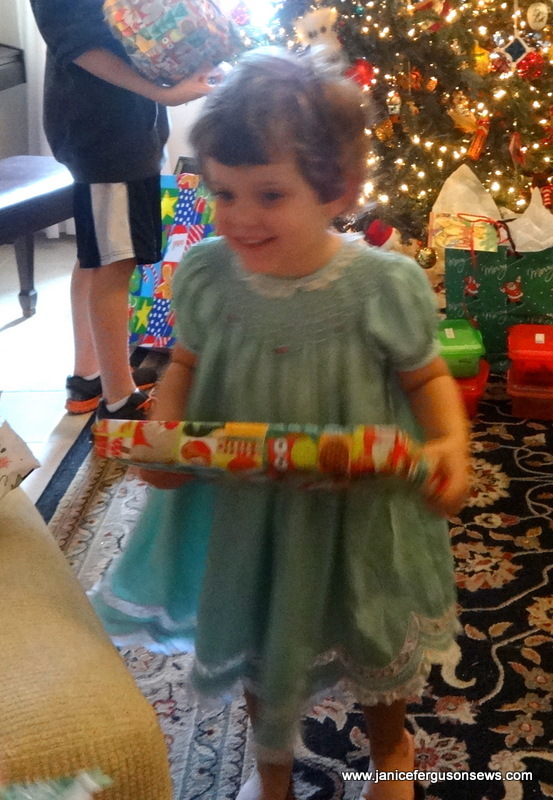 from list: Beautiful wrapping for a precious girl! Your workmanship survived the twirls! from Jerry: My sweet, precious friend there is nothing substandard about this spectacular dress. I saw this first thing this morning when my feed came up and I gasped. 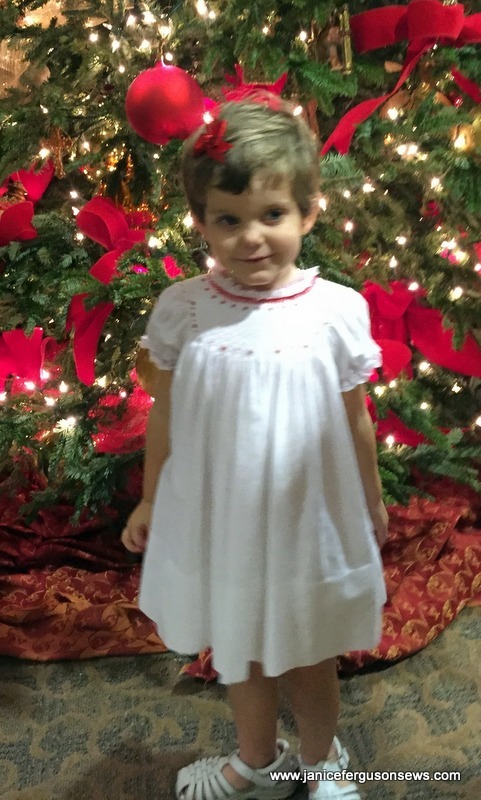 It is so, so beautiful on your smallest Christmas angel! 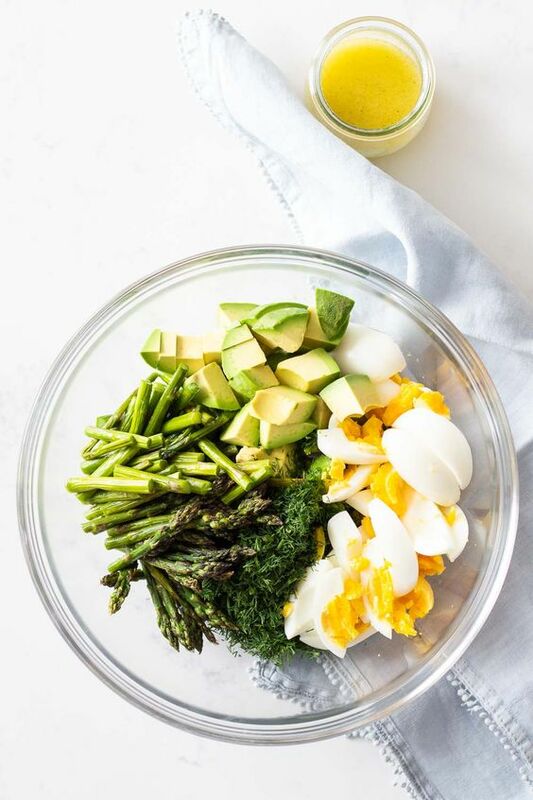 from Martha Pullen Forum: Fun to read your blog and see your beautiful creation. She’ll get lots more wear from a non-themed dress such as this one. It is just beautiful and I thank you for posting the video about the Tiger Eye. I’ve used Fasturn for years but the Tiger Eye is new to me. 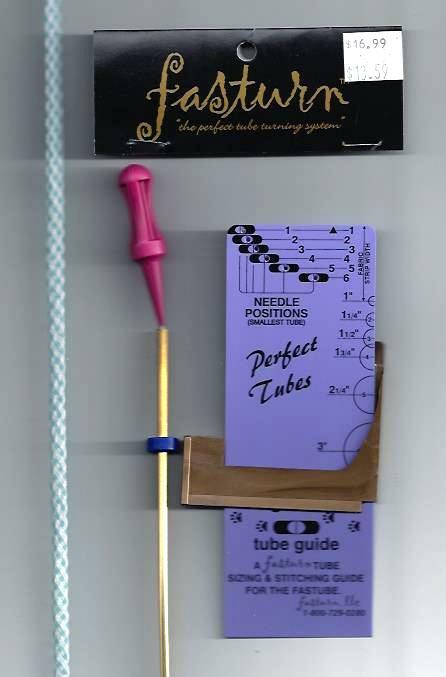 It looks like the perfect tool for accurately stitching those skinny tubes. From MP Forum: The dress is a delight and I loved your information on how you solved potential problems. The bias is lovely. But most of all I enjoyed reading about your family’s Christmas and seeing photos of the children. That bow tie was really cute and I am glad you posted the link to instructions. from Teresa: Gasp!! This is wonderful, Janice! I remember visiting with you and you weren’t sure what you would do for Christmas! Bi think you said “simple” and this is far from simple with all those scallops and lace! 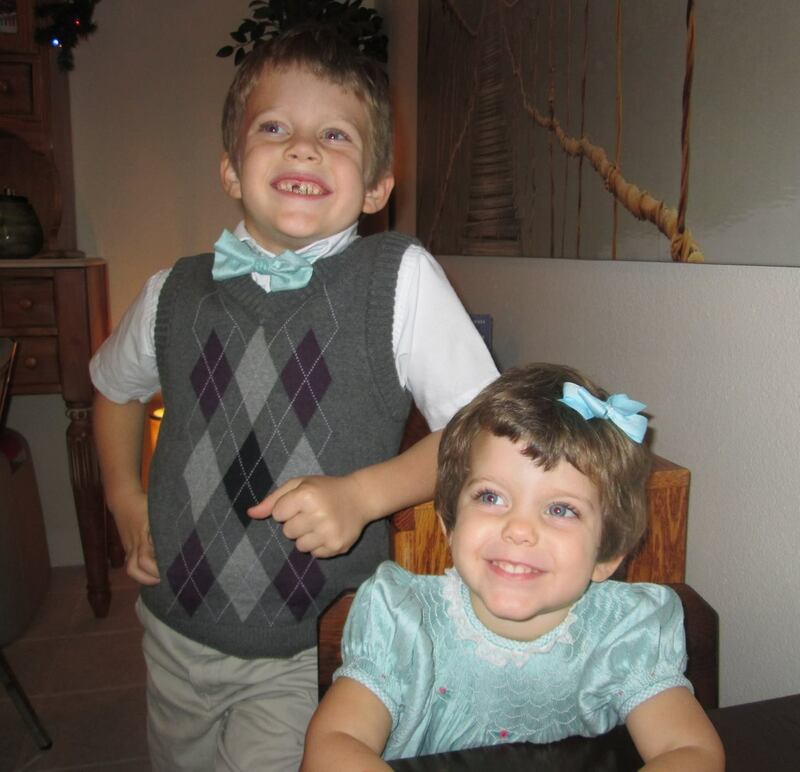 Beautiful little dress for your little sweetheart and brother looks so dapper in his matching bow tie and argyle sweater vest! Thank you, All, for these kind words and prayers for my eye surgery. Teresa, this dress DID start out as a simple bishop, but it seems all my “simple” projects grow into something more complicated. 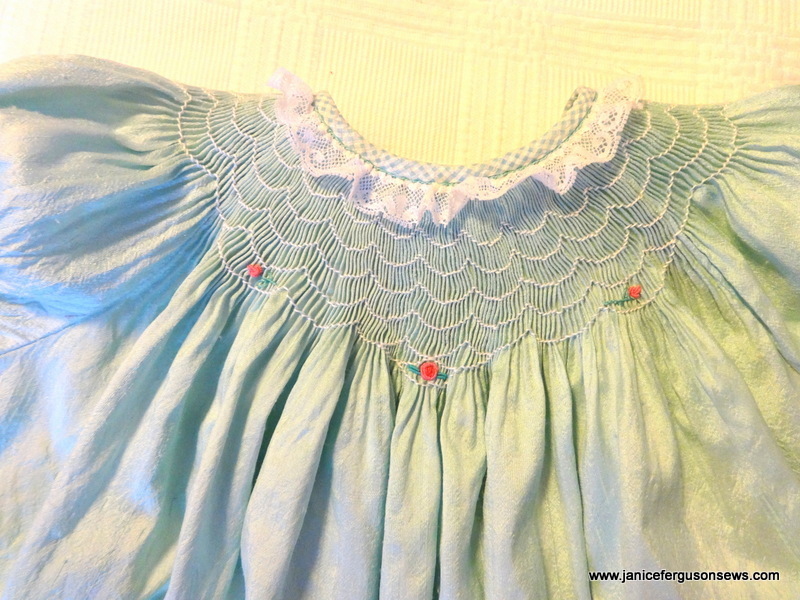 This is how it goes…….”a smocked Betsy bishop with a simple scalloped smocking design–how long could it take? 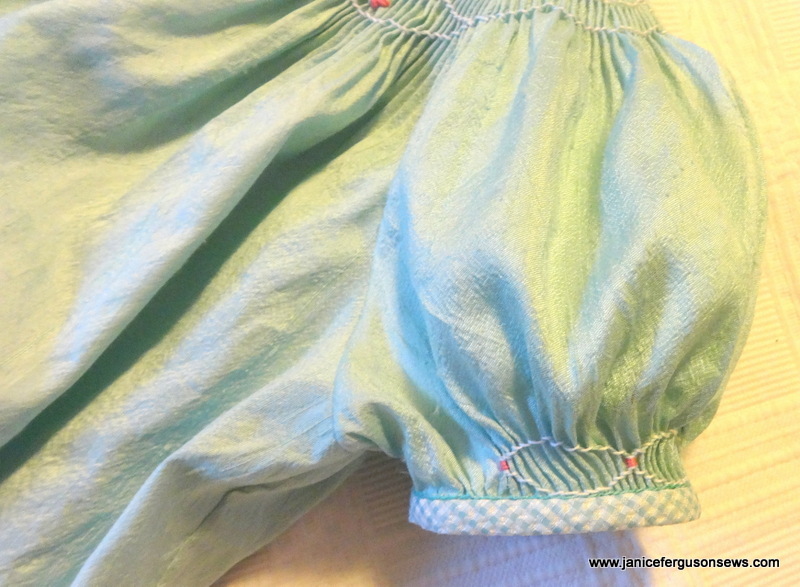 I’ll just add a scalloped hem to echo the smocking. Ooh, I have that nylon heirloom lace! I’ll use that. Uh, it needs something between the two rows. But I’ll have to make the spaghetti bias. How long can it take? yada yada yada….” Surely I’m not the only one who starts out simple and ends up not so simple. Am I right? from SewForum: Wow, I must say, Beautiful ! She looks so cute in it. 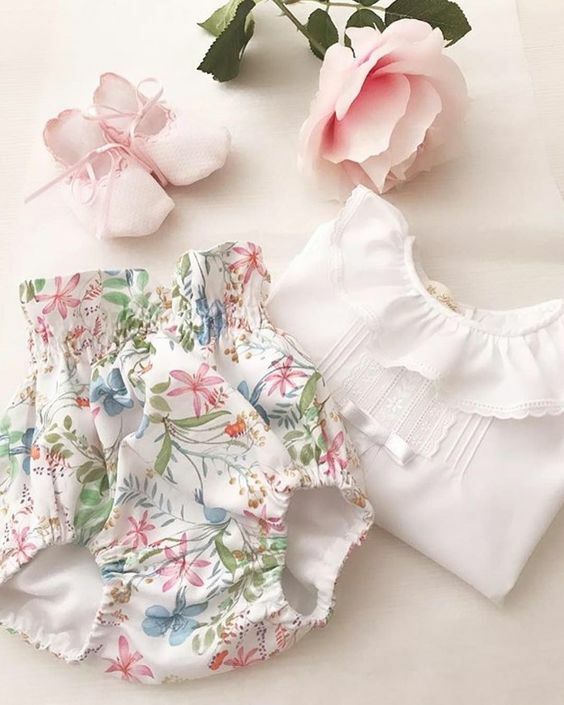 from SewForum:Beautiful!!! Outfits and the kiddos. Thanks for sharing. try it on a garment LOL! So thank you, thank you for sharing your lovely creation. Linda, I will be forever grateful to you for alerting me to this great product. I love it but was a little disappointed that most of the patterns I ordered were out of stock. But NoSiree that didn’t stop me from buying yards and yards and yards of it! I will order again soon and hope there is a greater selection. Of course, I don’t NEED lace. But I want some of that pretty stuff. It is sooo soft. Thanks again. 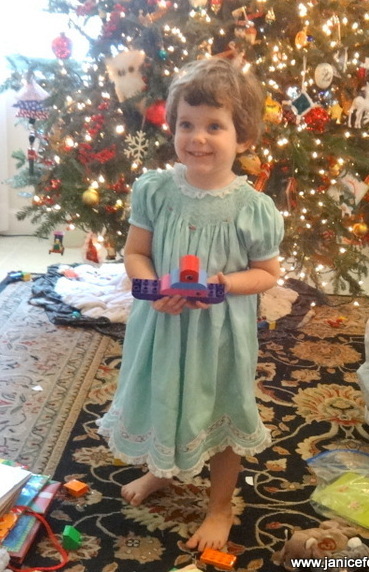 from SewForum: The dress is beautiful but the star of the show is that cutie wearing it. Thanks for posting the pictures. nylon lace for this. Paired with Imperial Batiste, I think it’s a win-win situation. you, I hope he re-stocks. The header thread situation is something I’m going to study today. Not all of them have this, right? to handle it…once again, I thank you : ). 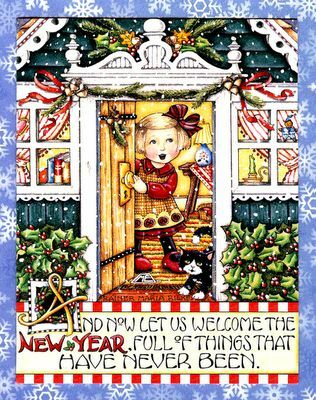 from SewForum: So adorable! Always enjoy your creations! Having a wonderful, relaxing time looking through your blog this morning. I had to come over and look at this pretty dress after seeing it on FB. I keep thinking that one day I will have the chance to try a bishop and learn to smock. So very pretty! Thanks That’s high praise from you, Cheryle. With all your talents, the addition of smocking to your repetoire would make your creations even more fabulous, if that is possible. I’d be happy to send you a pleated piece for practice if you like. Just drop me a note. You would love it. OMG! Vivian has the most beautiful blue eyes!!! And the dress you created is FABULOUS!!! And are you no longer sewing special dresses for Laurel? Too old already? They grow WAY too fast don’t they? My first grandchild was born last December, and I can’t believe she’s 5 months today!!! And this grandma has yet to smock anything for her! from SewForum: Beautiful! Love that proud big brother with his matching tie.